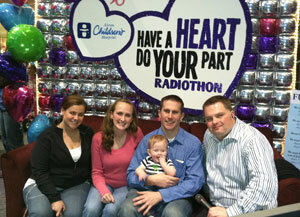 Last week, we were able to participate in the Have a Heart Do your Part radiothon. WOW! To be honest, I’d never heard of the event before it was brought up during a conversation with one of our friends at the hospital. We agreed to share our story in an interview to maybe encourage the community to give financially to an amazing organization that puts its families first. We became addicted to listening and watching the entire weekend. 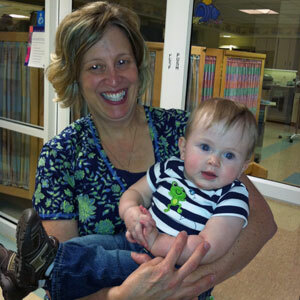 We feel that our family has been multiplied because of our connection with Akron Children’s Hospital. The children whose stories were told captured our hearts and they became our heroes. If you listened I’m sure you heard the story of Jedi Gino. He’s a 10 year-old boy who is fighting against cancer. Randy and I both felt our hearts leading us to this boy. We were star struck when we were getting ready to talk with Keith Kennedy, the host. Then, we spotted Jedi Gino. We couldn’t help running up and asking him to take a picture with Jordan. He introduced us to his aunt and mom. I truly feel God brought another family into our lives as we shared our stories with each other and were able to pray and encourage one another. It’s a time that won’t soon be forgotten. As our time drew to a close, Randy and I both noticed that the president of Akron Children’s Hospital, William Considine, was observing the event. We took the opportunity to thank him for Akron Children’s Hospital and let him how much it means to our family. We were overwhelmed by Mr. Considine’s friendly nature. As the conversation continued he made it a point for us to understand that this hospital is a place that treats their patients as if they were their own. What a philosophy that runs from the president down to the maintenance employees! Wendy was so excited to see that Jordan is doing well. It was so exciting to spend a few minutes to express our gratitude to her for the time that she has put into caring for these angels in the NICU. Dr. Anton Milo is awesome!